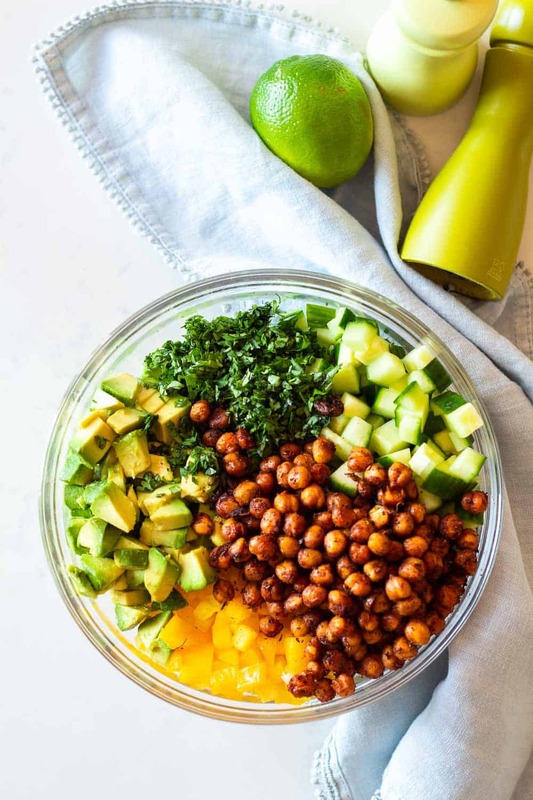 Find all the best Avocado Salads in one place! 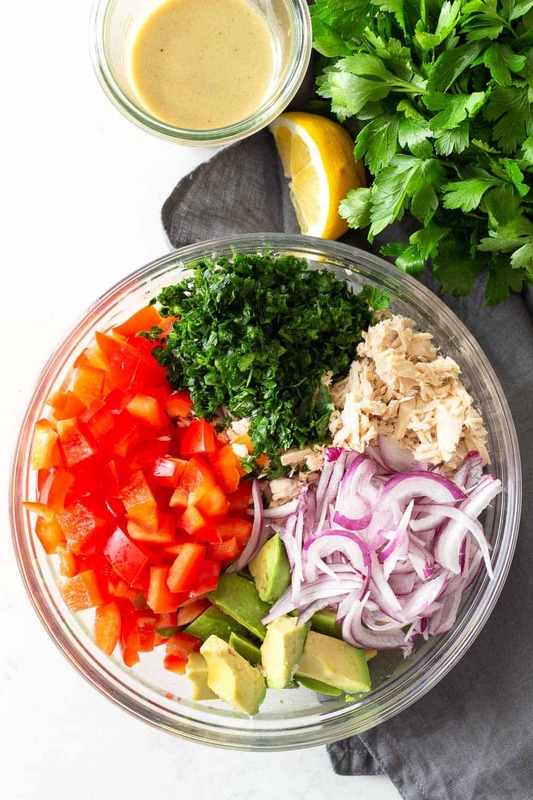 Avocado Chicken Salad, Avocado Tuna Salad or Avocado Egg Salad you’ll find them all. Plus printable recipe card to hang on your fridge or file in your recipe folder. Can you imagine that growing up in Germany in the 80s/90s it was suuuuper difficult and expensive to get your hands on avocados? Most Germans back then had never eaten one. I remember going to the grocery store as a university student (we’re talking late teens, early twens) and see a young couple my age with a printed recipe and standing in the produce section asking each other what that “avocado thingy” on the list could possibly be and look like. (Yes, I did approach them to show them, in case you’re wondering, lol). Yes, most people back then had not only never tried an avocado, they didn’t even really know what it was. It was exotic! And now?!? The world has shifted 180 degrees. Avocados are all the hype all over the world! Avocado Salads have become staple recipes for millions of cooks of all ages all over the world. My Peruvian mother made sure avocado and quinoa were one of my first foods as a baby, she brought them all the way from Peru to Germany in her suitcase whenever she went to visit her family. She knew already back then that those were absolute super foods. So over the course of several weeks I have been working on a series of delicious avocado salads and got amazing feedback from readers. Everybody seems to absolutely love! 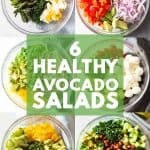 avocado salads! 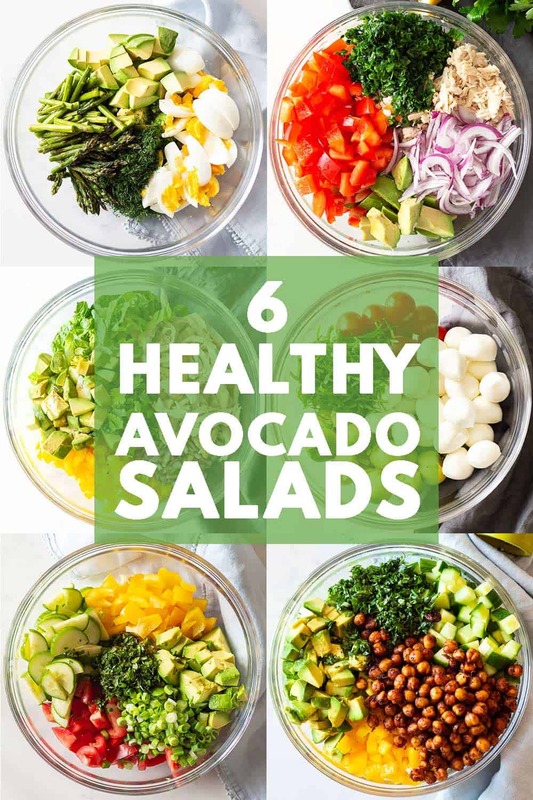 The one thing people have been repeatedly asking is if I could have a place on the blog where all those avocado salads could be found together. 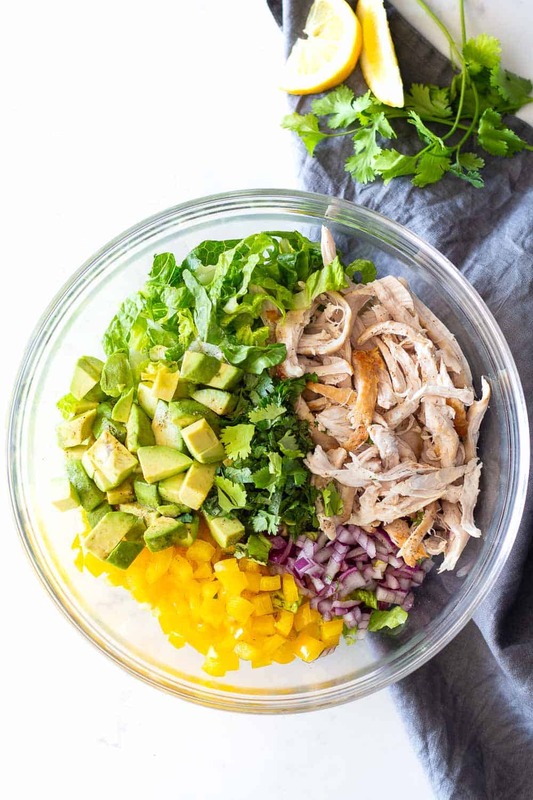 This Avocado Chicken Salad is incredibly simple but sometimes the simplest recipes are the very best. Healthy clean ingredients thrown together to make a complete and balanced meal. The bacon is optional but surely recommended. It gives it that little extra special flavor and texture. Plus, you bake it in the oven together with the chicken, so easy peasy. It’s the best recipe for a creamy, fresh, delicious and nutritious Avocado Tuna Salad. Pinky finger promise!! And the best part of making this recipe? It’s literally a 10-minute process! All you have to do is wash and chop your veggies and avocado, drain the tuna, prep the dressing and toss it all. That’s it! 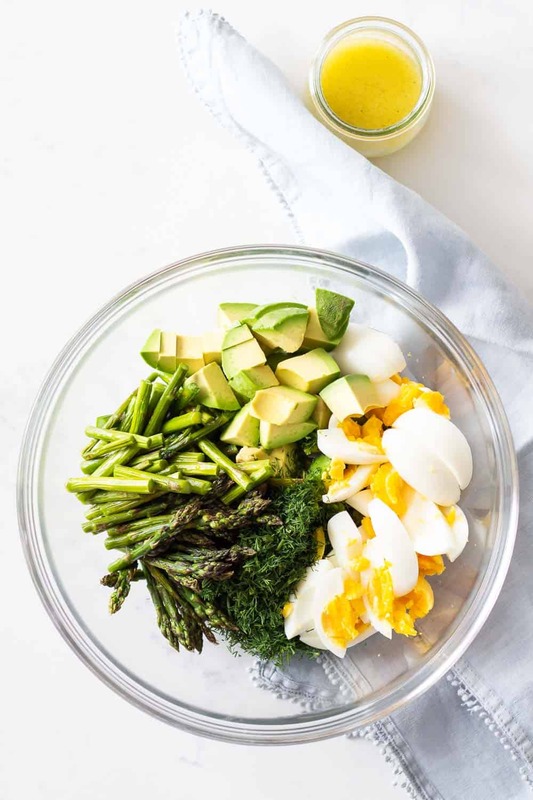 Eggs and asparagus are meant to be together!! add dill, olive oil, lemon juice, sea salt and pepper. Tadaaaaa, that’s all there is to it. It takes a mere 15 minutes to have the salad on the table. The perfect quick weekday dinner! 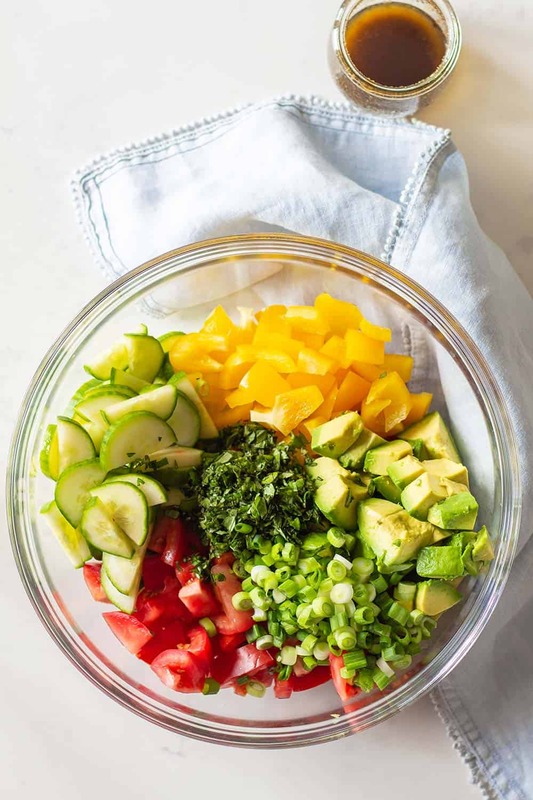 It couldn’t be simpler than with this Cucumber Tomato Avocado Salad! Just chop up some crunchy English cucumber, juicy roma tomatoes, some bell pepper if you like, add avocado a bit of fresh basil and spring onion and you’re as good as finished. I chose basil for this salad because I feel like a balsamic vinaigrette goes super well with the ingredients. You can just as well add cilantro though and make a lime dressing instead. Tomato Mozzarella salad (a.k.a. caprese) has always been one of my favorites. I grew up eating that A LOT and I love to reinvent the same recipe over and over. 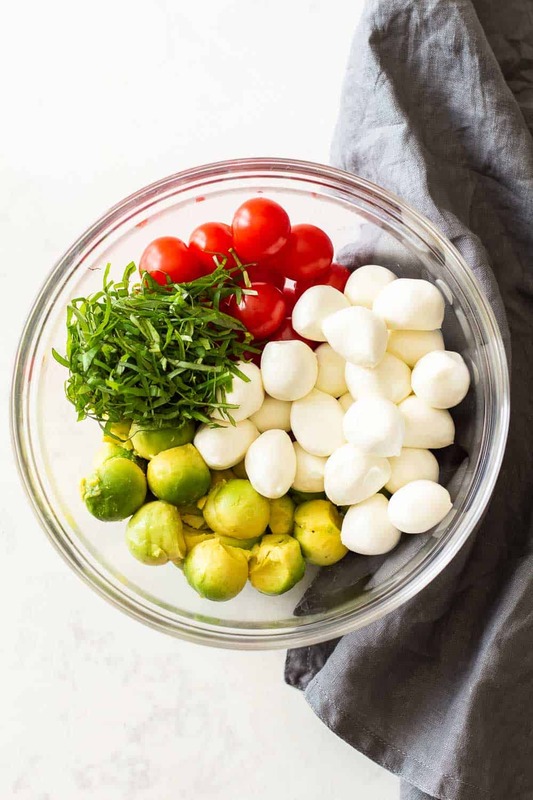 For this Avocado Tomato Salad I basically added avocado and butter lettuce to that famous caprese combo because the creamy avocado and crunchy butter lettuce are awesome with tomato and mozzarella. After trying cajun seasoning for the first time I dreamed about coating some chickpeas in similar spices and roast them to make them spicy. You cannot imagine how amazing this tastes in a Cucumber Avocado Salad. It’s like adding spicy chips to your salad but without making it unhealthy. I hope you enjoy your weekly or daily (?) avocado salad as much as I do! Tell me, which one is your absolute favorite? Also, if you like this Avocado Salads round-up, could I kindly ask you to pin it so others can find it, too? It would mean the world to me!! Print the above linked recipe cards for instructions on individual recipes. Nutrition Info for all 6 recipes combined excluding oils. Made the avocado asparagus salad tonight for dinner. Added left over parmesan boneless chicken breast from last night dinner. Trying to eat more healthy with less carbs. Not only was this quick and easy to make, it was absolutely delicious. Will defiantly try other of your recipes. Thank you so much Bryan! !